A Christian view of evolution. Even Darwin was worried that his theory of evolution would antagonise Christians because it seemed to cut God out of creation altogether and leave him with nothing to do! 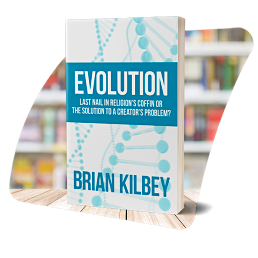 In this book, Brian Kilbey provides the evidence for an evolutionary process which doesn’t seem to need supernatural direction. But rather than interpreting this, as some have done, as pointing to the non-existence of God, he prefers to ask whether there may be good reasons why a very real God would refrain from directing the evolutionary process. Perhaps He had some more profound objective in mind, one that necessitated his withdrawal from the project’s control? This may be bound up with the difficulty of bringing into existence a creation with the complete freedom to love its Creator. This idea is explored along with several related issues, for example, Is God really as almighty as Christians believe, can He really do what He wants to do? Where does Jesus of Nazareth fit into the narrative of evolution? Did human disobedience bring about a break in our relationship with God and what is today’s message of the Gospel in the light of what we know now about the history of life on earth? The book is intended to stimulate discussion among those who are exploring the Christian Faith. Brian Kilbey is an Emeritus Professor at Edinburgh University.